Nayanthara has become a superstar in her own right and is doing some meaningful films in Tamil. The latest we hear is that she has given a nod to a short filmmaker for her next film. Going into details, a young man called Sarjun has been creating waves in Tollywood with his short films like Maa and Lakshmi. 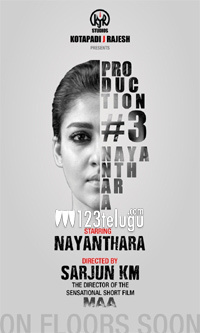 As these two short films have been garnering some good views online, Nayanthara approached the young filmmaker and asked him to narrate a script for her. The young boy has now narrated a story which has been right away appreciated by the star actress. The project is a horror thriller and will soon go on floors in Chennai. More details of this film will be revealed soon.